Glycerin Soap is truly gifted at SpaFetish! Each glycerin soap bar is handcrafted and loaded with Olive Oil, Sweet Almond Oil, Shea Nut Oil and Kuki Nut Oil to render a completely natural soap that will leave your skin squeaky clean -- without stripping your body temple of its natural oils. Thus, if you adore handmade natural soap bars that are vitamin rich, bursting with antioxidants and drenched in organic essential oils, give these uber chic eco soaps a try. Our Glycerin Soap is equally good as a mild facial soap or as a natural bath soap. Whichever way you choose to enjoy them, we are certain that they will be a welcome change from the ubiquitous commercial soap bar. 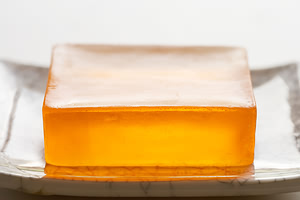 This is our Chamomile Glycerin Soap twice blessed with German and Russian Chamomile, while a splash of Agave Nectar adds a level of sweet complexity. 4 oz. A gratis shower puff sponge is included. This is our Lemon Glycerin Soap cocooned in Lemon Essential Oil and Verbena extract, while a fresh note of Chervil imparts a delicate hint of Anise flavor. 4 oz. A gratis shower puff sponge is included. This is our Pear Glycerin Soap drenched in sweet Pear Nectar, while an unexpected note of organic Celery Root gives this chic soap a deliciously fine finish. 4 oz. A gratis shower puff sponge is included. This is our Cucumber Glycerin Soap imbued with a soft puree of fresh Cucumber, while a splash of Grapefruit gives this bar a gorgeous note of fresh citrus. 4 oz. A gratis shower puff sponge is included.